In my last post, I had raised some concerns about the rising numbers of super bikes, getting ready to zip through the India roads. Well, concerns on side, it's time to praise these awsome machines!!! So, let's start with the Monster. Giving life to the design of Miguel Angel Galluzzi, Ducati introduced the Monster series way back in 1993 through 2000, starting with the M600, followed by the M750 and lastly M900 fleet, where the number denoted the engine size of the bike. With the launch of M900 in 2000 Ducati introduced Fuel Injection to the Monster Series. 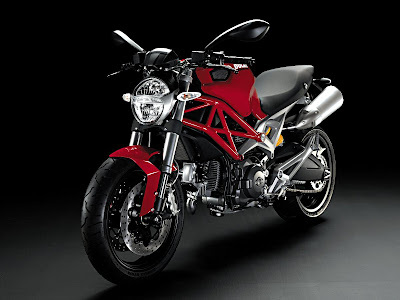 Again in 2001, Ducati introduced the Monster S4 - a liquid cooled, 4-valve engine, accompanied by semi-floating front disc brakes with Brembo four piston calipers, lighter Brembo Wheels and also 43mm Shova inverted forks. The Ducati Monster fleet comprises of six models - the 695, 696, S2R 1000, S4R Testastretta, S4R S Testastretta and the S4R S Tricolor, with the 2008 696 being the most recent addition to the fleet featuring the Ducati Desmo L-Twin engine to ensure more power dispersal at the command of our wrist bone. Ducati's lead designer Pierre Terblanche's designer sprang out of the design board in 2003, in the shape of the the Ducati Multistrada, a classic Sports Touring Machine designed and build to handled a wide range of riding conditions with equal agility (Multistrada - in Italian means "Many Roads"). 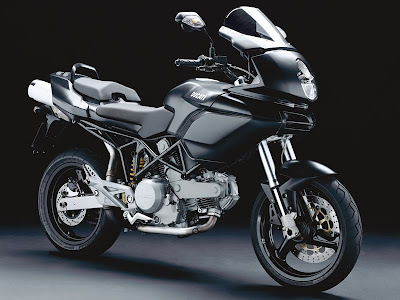 Launched with an engine capacity of 1000cc (and also a 650cc cousine), the Multistrada didn't go much metamorphosis except for some cosmetic nip tucks. The 2007-2008 version of the Multistrada recieved 100cc more power than the previous versions which produced five more foot pounds of torque. Sideways the bike looks very similar to our Indian style icon the Pulsar 220. 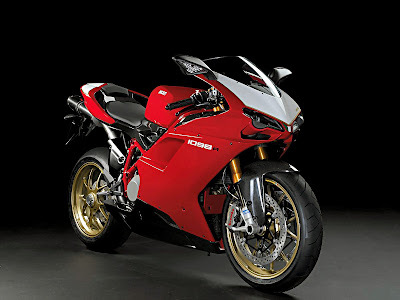 Amongst the Superbikes for 2008 from Ducati, comes the 1098 series. Worked upon the platfrom of the 998 (which was based on the 996 which was used in the Matrix Reloaded Chase sequence), the 1098 carries forward the single-swing arm tradition of Ducati. Comming in three variants, 1098, 1098S and 1098R, the series boasts off quite impressive performance figures. The 1098/1098S produces 160 hp, 122.6 N-m torque while weighing 173kg. On the other hand 1098R produces 180 hp, 134 N-m torque while weighing the same as the other variants. 0-60 mph in a time less than 2.6 secs and top speed touching 299 kmph. So, on the performance front, the 1098 sits comfortably as the only production Super Bike in it's class having the heighest torque-to-weight ratio. The 1098 series has won many accolades all over the world including the Bike of the year 2008 award from SWA (Supertest World Association). The Indian market and conditions would be a good testing ground to prove the authority of these bikes. At least their success would prove to be the Oort Cloud for the Indian Performance Biking.